Today, a stranger left her beauty mark on my day. After roughly 3 hours of consistent sleep last night, let's just say that I wasn't having the best day in the world. My sweet baby girl was crying and it seemed like I couldn't do anything to console her. Once she finally fell asleep, I sat on my bed and took a deep breath to clear my head. Some time passed, and before I knew it my husband was home from work for a home-cooked lunch. While he ate and watched Grace, I got myself ready for the day and prepared to head out and run a few errands. One of my errands for the day was to go to Target and get rice cereal and diapers. As usual, Grace cried the whole way to the store. She hates her car seat. After snagging a great parking spot near the door, I got her secured into the stroller, hooked on my diaper bag, and off we went into the store. Before going to the baby aisle, I quickly browsed through the sale racks (as usual) and didn't see anything I couldn't live without. I then proceeded to the baby aisle and parked the stroller in front of the baby rice cereal. Contemplating which size to get, I opted for the large box since it was the best deal for the price. I then turned around towards the diapers and began my mental calculations of which diaper package was most cost-effective as I thought to myself, Man, I wish I had a coupon. 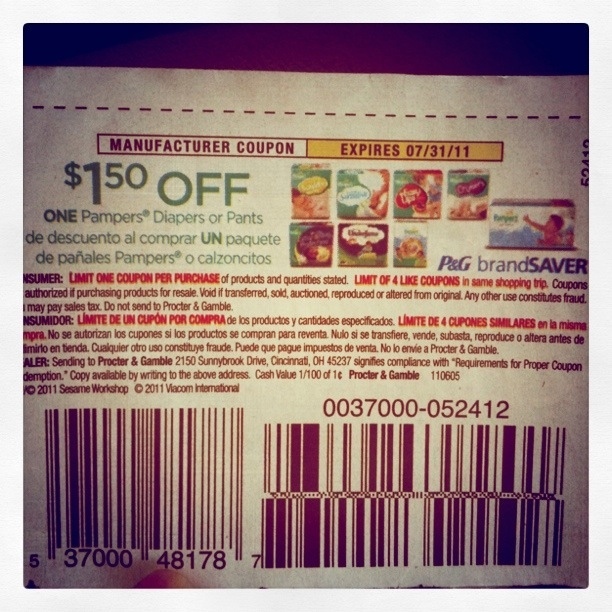 Within seconds, a sweet lady standing in the aisle near me said, "I have a coupon for Pampers. Would you like one?" You should have seen my expression. (I'm such a believer in "the little things" in life). As a huge smile crept onto my face, I replied that I would love to have a coupon. "Hey, Lord knows, every little bit counts when it comes to saving money!" she said with a warm smile as she handed me the coupon. I went on to tell her how I've been trying to make my Target Baby gift card that I received at a baby shower stretch for the last few months, and admitted to using it for a cute top for myself every now and then. We both laughed and I thanked her again as I left the isle and proceeded to the register. You know, we serve a big God that specializes in the little details of our lives. I believe that God used this situation, and this precious lady, to once again display His love and care for me. I just want to take the time to say thank you to Him, and to the beautiful stranger, for leaving a beauty mark on my day and turning my frown upside down. And now, in the best way that I know to show my appreciation, I will make it my goal to be a beautiful stranger and bless someone else in return.